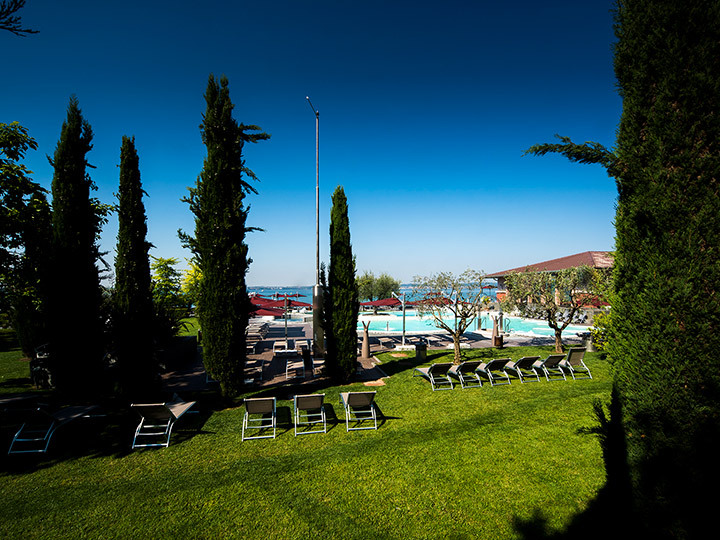 An experience of pure relaxation and thermal wellness, surrounded by the spectacular setting of Lake Garda. 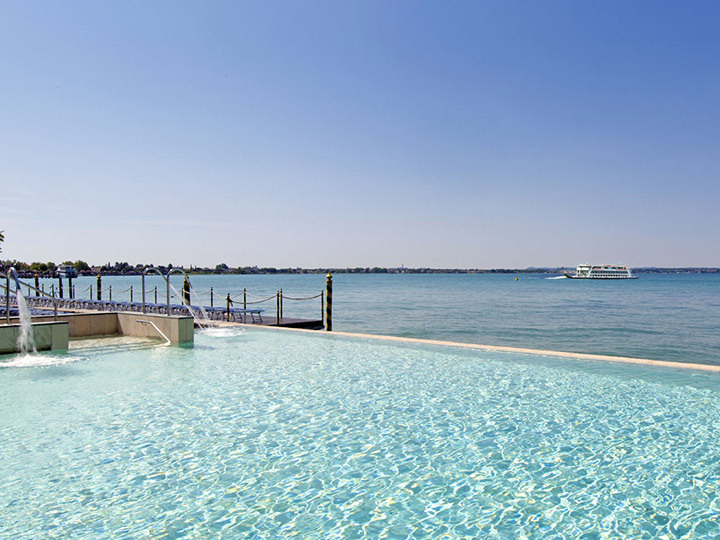 In a wonderful medieval town steeped in history, the “Pearl of Garda” so praised by Catullus, lies Aquaria, the Thermal SPA of Terme di Sirmione. 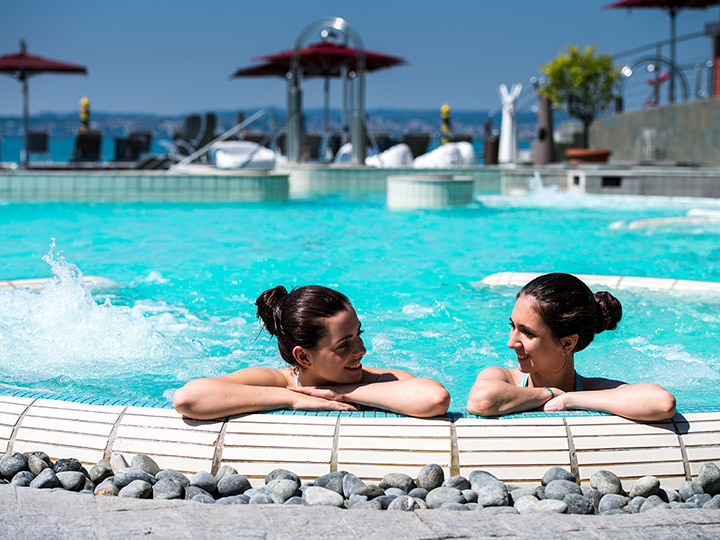 An oasis of wellness immersed in a large park, a place to enjoy moments of intense pleasure all year round, during the day or in the evening, alternating the sensorial experiences of the thermal water, the steam and the heat, the pampering of personalised treatments. 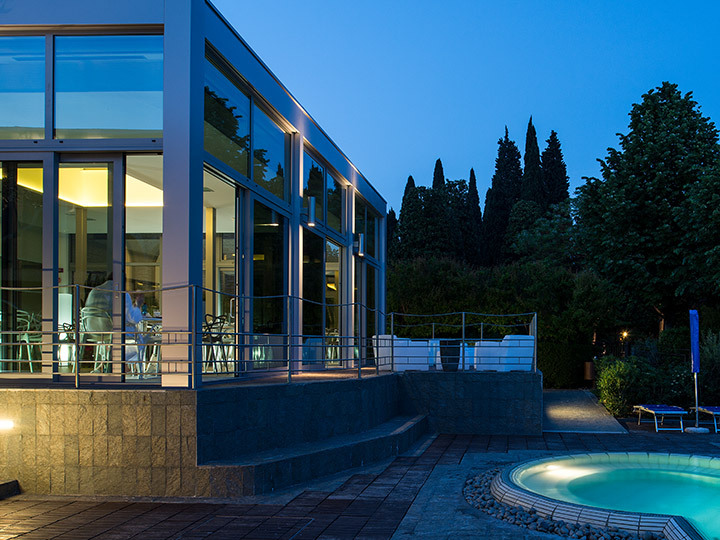 Amidst the thermal water and the breathtaking views of Lake Garda that suffuse Aquaria with the enchantment of the sunset, our guests find beauty, equilibrium and harmony. 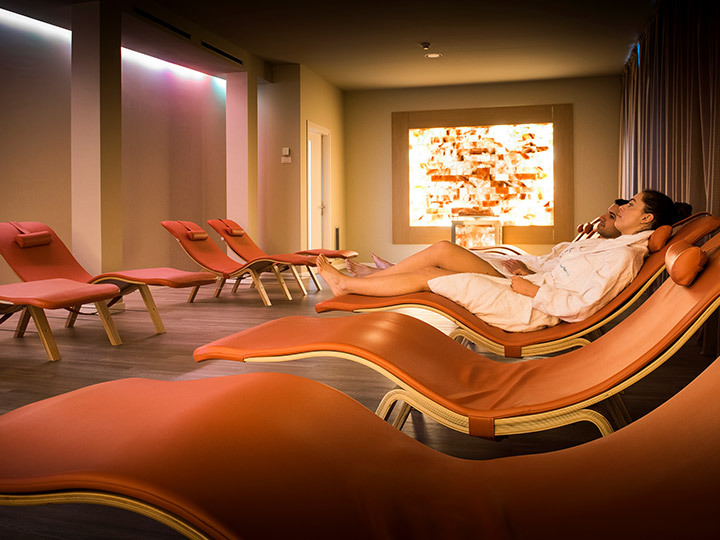 More than 10,000 square metres of wellness, of which 700 contain thermal water with swimming pools, hydromassage, effervescent beds, saunas, steam baths, sensory showers. Rich in mineral salts and micronutrients, the sulphurous water containing sodium chloride, bromide and iodide is vital for the skin and the whole body, at all times of the year. 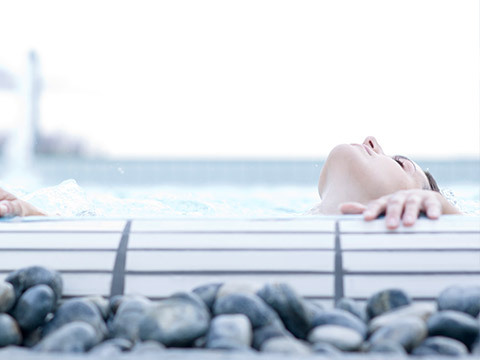 Its temperature is at a constant temperature of between 34 and 36 degrees, allowing the outdoor swimming pools to be used even in winter, and its exfoliating properties prepare the skin for tanning in the summer. 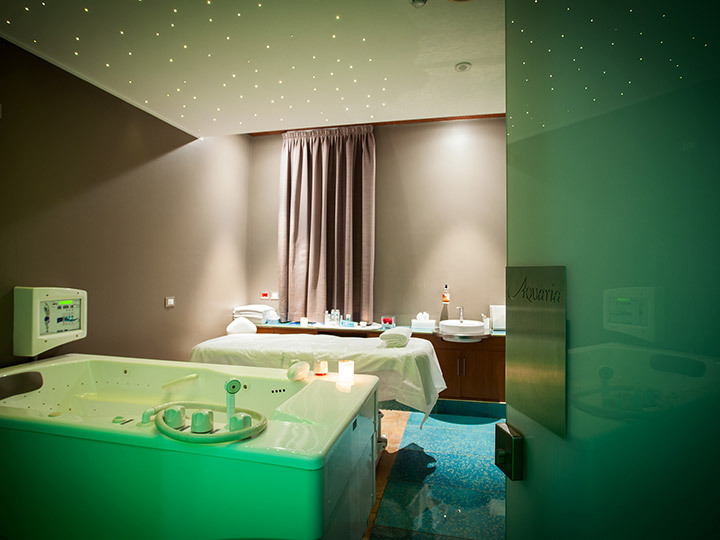 Everything at Aquaria Thermal SPA is designed for all round wellness. 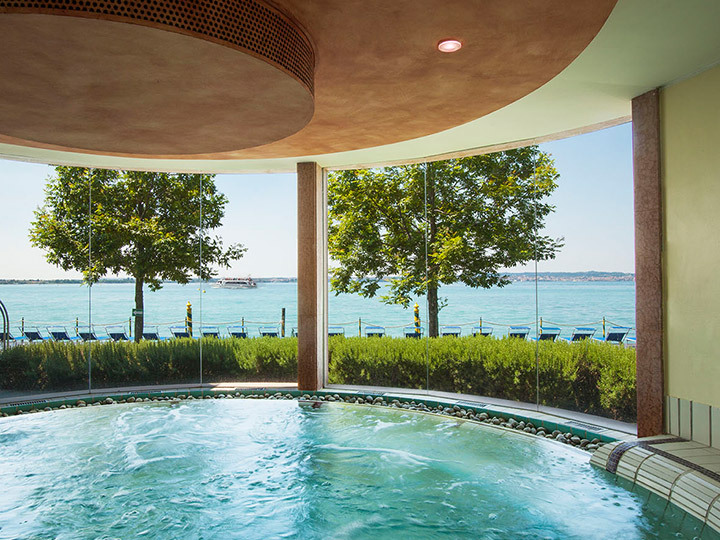 The SPA is furnished with an indoor thermal swimming pool with an exterior view of the lake, equipped with cervical jets and effervescent beds. A course of treatments dedicated to the health of the legs. 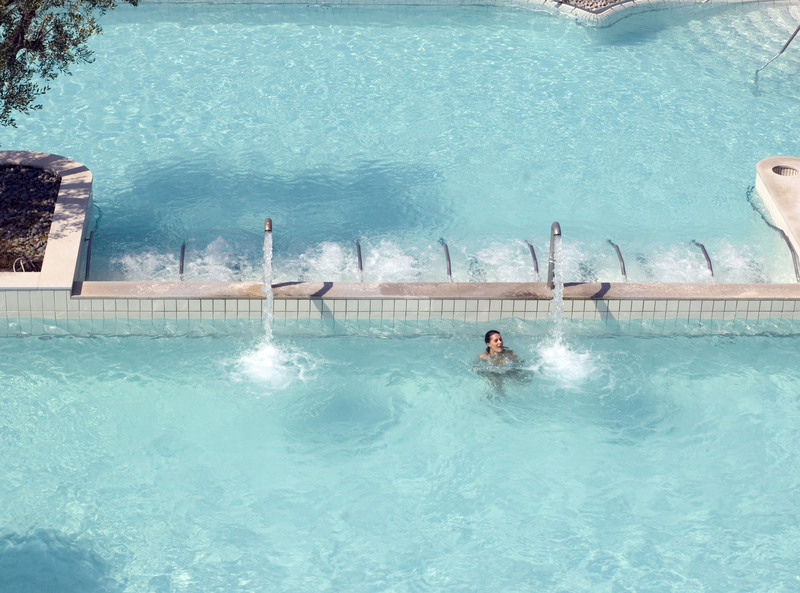 The course is conducted in two crescent swimming pools and water corridors at 24°C and 34°C, equipped with side hydromassage with adjustable height. The action of the water jets combined with the temperature range reactivates the peripheral circulation and tones the skin. 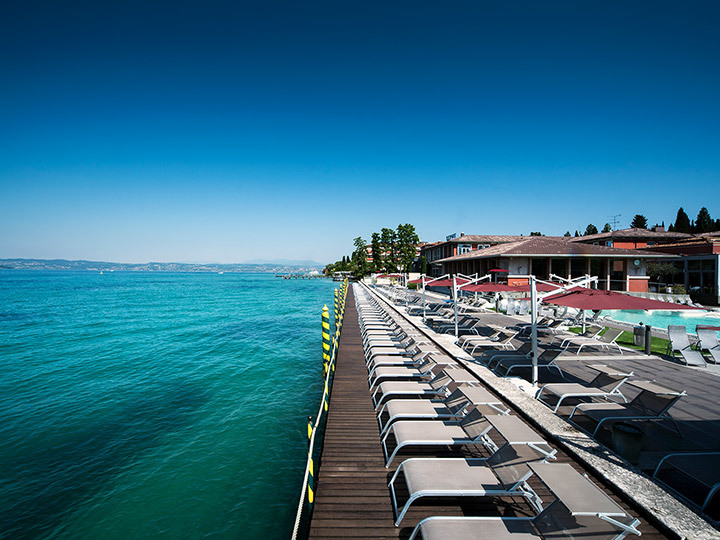 Aquaria has a store dedicated to Terme di Sirmione’s products: for relaxation, free time and wellness, and articles created in collaboration with the major brands. 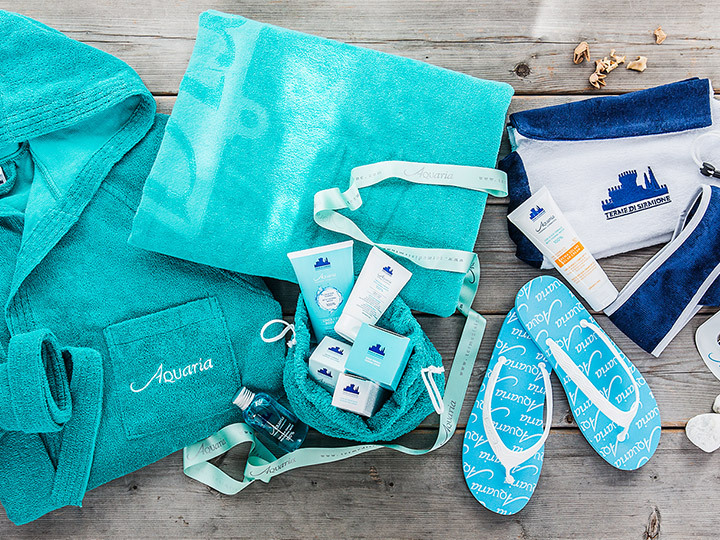 Shoppers in the store can buy items from the cosmetics line Aquaria Thermal Cosmetics, Termemotion vouchers and the articles of the Aquaria Collection as well as the historic Acqua di Sirmione. 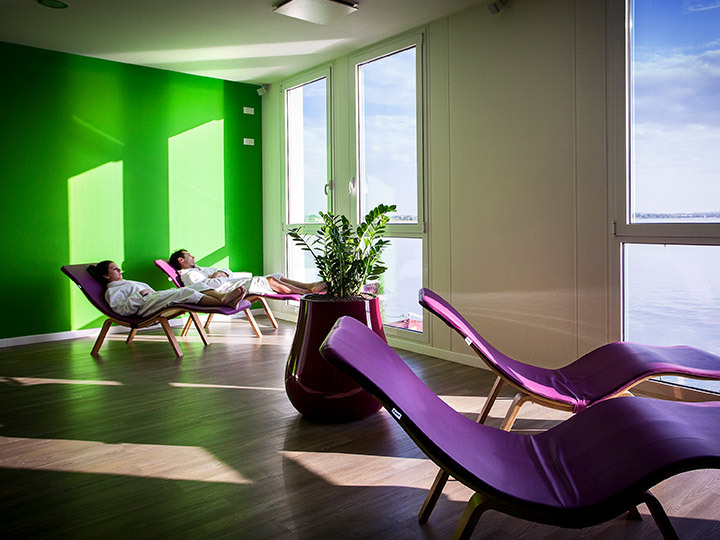 Outside, with a view of the lake, there is a large tank of fresh water at ambient temperature for relaxing after a sauna and enjoying the stupendous sunsets or to practise Acquagym. A circuit of saunas and steam baths at different temperatures, including a Turkish bath, a soft sauna, a Finnish sauna and a steam bath, divided into two zones with two different levels of humidity. An ancient ritual to enjoy the benefits of thermal mud scented with essential oils.The skin will be renewed, luminous and velvety, deeply purified due to the exfoliating and rebalancing properties of thermal mud and marine salt with Bagno Termale. 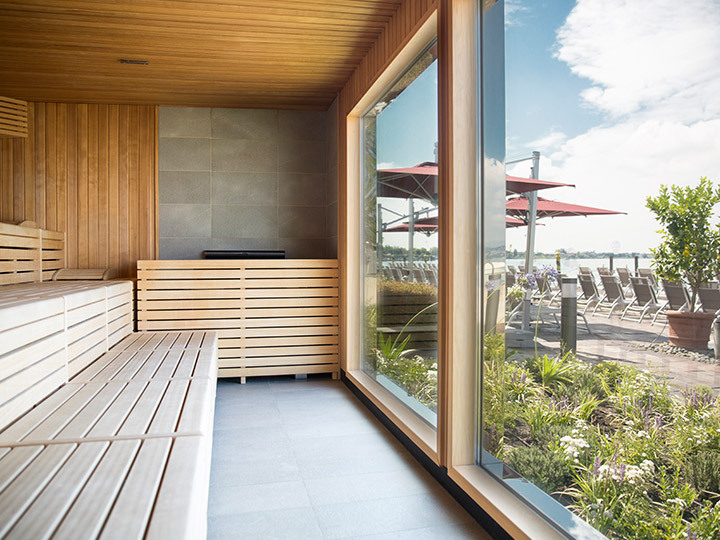 With a large window overlooking the lake, the Finnish sauna features a high level of dry heat and little humidity. The intense perspiration and dilation of the pores allows the body to get rid of toxins and acids, exerting a deep depurative action on the skin that appears more luminous and toned. Every cabin is provided with music and light to envelope clients in an ethereal and relaxing atmosphere. Many types of treatments are available, depending on the needs, and can be experienced as a couple. 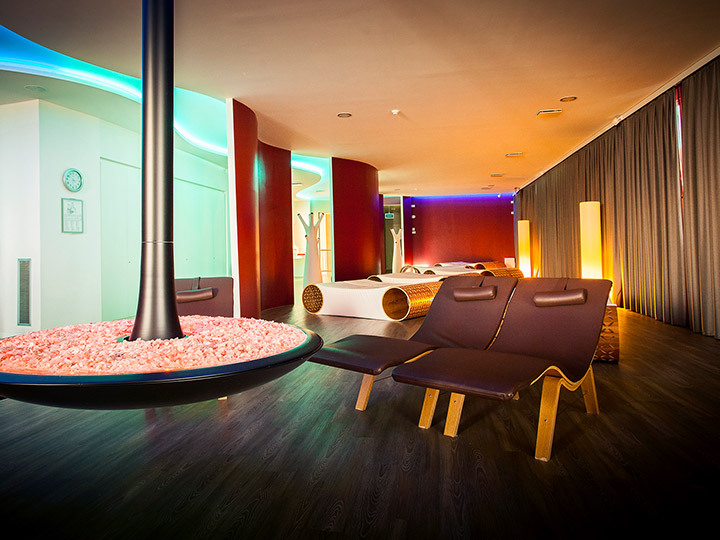 Perfect spots to relax and recover the normal body temperature and metabolic functions and to steer the mind and body to a natural equilibrium. Inside the tubs, different types of hydromassage can be tried with water jets at different intensities. 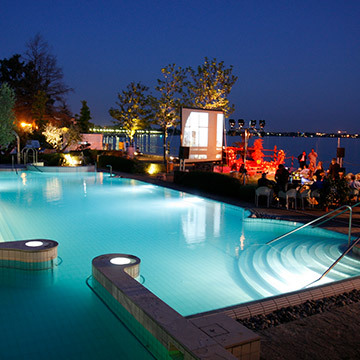 Three outdoor hydromassages are available: Gaia, Sana, Viva; an indoor hydromassage: Diva. 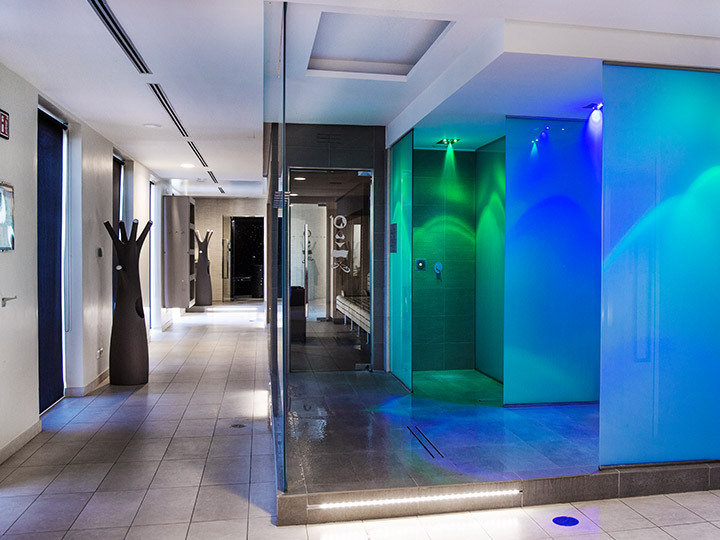 Varying in heat, intensity, colour and aromas, the showers deliver a multisensory water experience. There are six types: a journey through the Warm Mist, the Summer Storm, the Tropical Rain and, completing the circuit, the Cold Mist, the Cold Rain and the Cold Storm. All the menus served in the Aquaria Thermal SPA use top quality foodstuffs and comply with the most authoritative and up-to-date scientific indications in the field of nutritional science, in accordance with the directives of Dr Anna Villarini, one of the most widely acknowledged researchers at the international level. 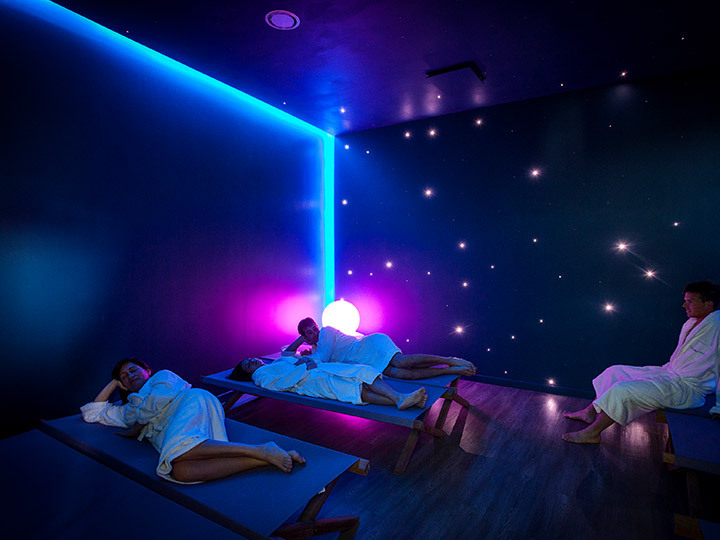 The benefits of mineral salts for the respiratory system combined with the relaxing effects of the light and the intensity of the heat and humidity create a pleasurable microclimate that encourages sensations of relaxation; the two illuminated walls of salt amplify the experience. Surrounded by music and immersed in the pleasures of its notes, specially created by a sound designer, the music room promotes the detachment from reality in order to enjoy a deep sensation of relaxation. Music means vibration and it becomes an active, multisensorial, relational, emotional and cognitive stimulation. Its rhythm influences the heartbeat and respiration and stimulates the release of endorphins, our bodies’ natural analgesic. At the end of a day filled with pleasurable activities, relaxing under a starry sky helps melt away tension and relax the muscles. A darkened room in which to dream with the eyes open, where the surroundings and the forms lose solidity, the orientation and the attention seep away. A Jacuzzi tub to be enjoyed in complete privacy, inside a cabin reserved for couples. Relaxation and wellness for two. 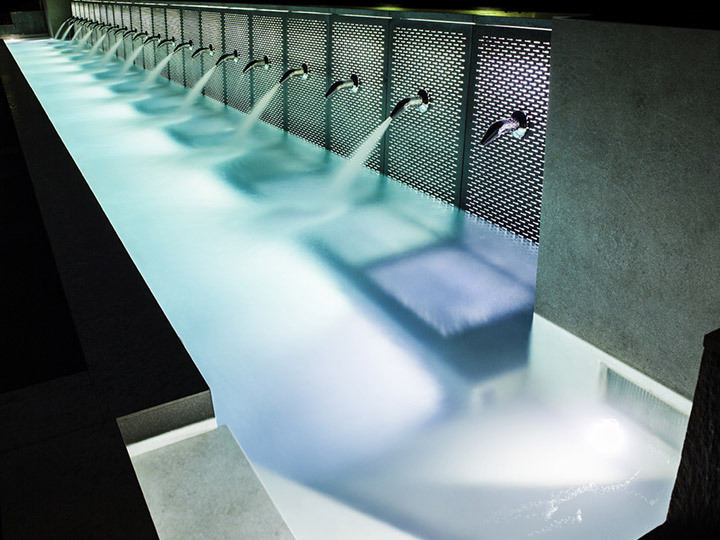 A cement hydromassage tub illuminated along its 18-metre length with 22 cervical cascade jets. The seats are lit with LED lights that alternate the natural colours of the water. The effect? Relaxing and spectacular. The park covers 6,500 square metres and is framed by water, to relax the mind amidst magnificent, centuries-old trees and an unrivalled view of the lake. And, at sunset, the panorama becomes truly unmissable. An elegant jetty on the banks of the lake for taking the sun and relaxing with an aperitif. Its westerly position is perfect for admiring the breaktaking sunsets. Thermal and aesthetic treatments to regain wellness, health and beauty. 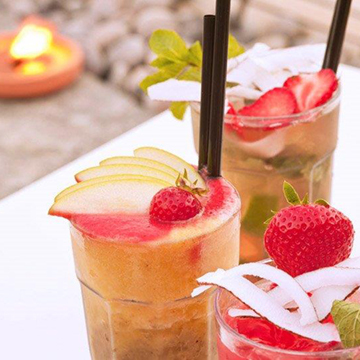 Find out all the special events at Aquaria Thermal SPA.